Javelin armed skirmishers, these light horsemen can also charge home with their spears when the need arises. They should not be committed against unbroken heavy opponents. Ayrudzi, literally means "the horsemen". These light cavalry are well suited to the mountainous home of the Armenians. These are light cavalry, best used for a harassing role. Armed with a bundle of javelins and protected by a Taka shield, these horsemen have no armour, preferring to use speed to protect themselves. After they use up their javelins, they can close to fight with a spear, though they are really too lightly equipped to stand up to any save the lightest of troop types. 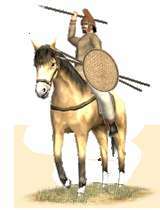 While not as long ranged or as tough as Armenia’s nomadic neighbour’s, horse archers, they fill essentially the same role, and any Eastern general would certainly want to include them in their army. Historically, Ayrudzi cavalry came from the poorer Azats (lesser nobles) and rich Ramiks (peasantry) of Armenia unable to afford better gear, but rich enough for mounted warfare, often a more prestigious service in Armenian armies.